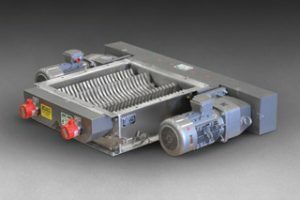 Munson Machinery presents its DeClumper™ Model RDC-3030-SS sanitary lump breaker that reduces agglomerates and compacted materials to original particle sizes. This sanitary lump breaker is ideal for deagglomeration of free- or non-free-flowing bulk chemicals, fertilizers, flakes, cement powders, carbon black pellets or hygroscopic products, and size reduction of large chunks of friable products and compacted powders. Standing at 279 mm tall, this delumper can fit into restricted spaces, and with optional feed hoppers and support bases, it can also operate independently. Material entering the inlet is reduced in size by four rotors with three-point, single-piece breaking heads rotating with minimum clearance inside twin, curved, and perforated bedscreens. On-size material exits through apertures in the bedscreens ranging from 25 mm diameter to 64 mm square. The interlocked side-removal bedscreens can be removed without tools for cleaning, changing or inspection. Bearings can be lubricated through external fittings and are isolated from the product processing area with air purge block seals, and can be fitted with optional air purge packing seals with split housings. The RDC-3030-SS is constructed of #304 stainless steel finished to sanitary standards and is available in #316 stainless steel, carbon steel, and abrasion-resistant steel (AR-235).